Home Cricket Poor Standard of Umpiring in IPL Raises Eyebrows. This year’s IPL has been marred with poor umpiring, raising the eyebrows of cricket fans and experts around the globe. Here’s how it all unfolded. This year’s IPL has been witness to many events that haven’t been seen in world cricket for some time now. Be it the “mankading” or MS Dhoni all charged up running into the field and challenging the umpire’s decision and subsequently being fined 50 percent of his match fees, this year’s IPL has been one of the most eventful editions of all. But one thing that has caught the eye of cricket fans and experts around the globe is the poor standard of umpiring that is being put up in most of the matches, and there is a fair bit of evidence to prove this. 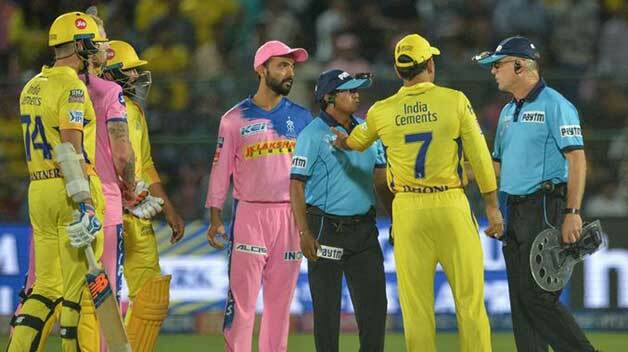 In the recent Rajasthan v/s Chennai encounter, a waist no-ball that was by the umpire at the bowler’s end, when it’s known that it’s the duty of the leg umpire and the umpire took back his call which left MS Dhoni furious. It’s not only the players who are upset, but the sharpest brains of the sport who are out there in the commentary boxes are also upset with the standards of umpiring that is being put up in the ongoing tournament. With the league in the stage wherein, even an extra run here and there can cost a team their place in the playoffs, the Umpires will have to rise up to the occasion and be more alert and aware of the conditions and the on-field umpires like they always do and check for all the possibilities with their counterpart sitting his cabin having access to all the footage and replays and all such technologies, ensuring a more engaging experience for the players and the audiences.